FINALLY! 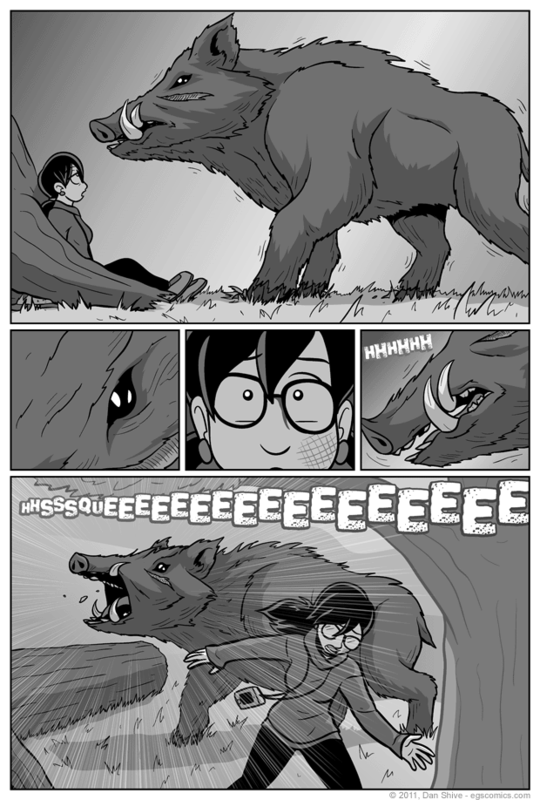 The giant boar is FINALLY in the comic! Seriously, this storyline's been in the works for a while now. I originally planned for it to be the third storyline in Bringing Silly Back, and I included a couple of teasers back during Sister 2. It's also what this sketchbook from back in September of this year was hinting at. So, yeah. This bun's been in the oven for some time, and this storyline is also hands down the one that has required the most amount of research. I'm not just haphazardly flinging this boar at you good folks. I know more about boars now than I ever thought I would have reason to. * I'm singling out Texas here due to it having the largest population of feral hogs in the continental United States, which would theoretically increase the likelihood of a random individual from that state having an informed opinion on boars and the dangers thereof. I am NOT assuming everyone in Texas has boars on the brain. I AM assuming everything is bigger and tougher in Texas on account of their tourism campaigns, however, including their "oh snaps". Incidentally, the name of the font used for the mighty squee is "Big Bloke". I felt it was appropriate.